It used to be regarded as a reliable and effective poker site, but ever since PokerHost left the Merge Poker Network, it has found that the grass is not always greener on the other side. The poker site first moved to the Equity Poker Network before finally settling on to the Winning Poker Network. These moves have been notably bad for the site with a major decrease in the site’s traffic numbers. When you add in the fact that the software being used on the PokerHost site is of a lower standard, there are many good reasons why it is best to not play on PokerHost. There is also the fact that the site only provides cheque withdrawals to citizens of the United States, so if you are looking for a good poker site, we recommend you avoid using PokerHost. Anyone looking for a reliable online poker site will look for a couple of things. Finding a site that has been around for a good number of years is of benefit and finding a site that is on a reliable poker network is of benefit too. In both of these instances, PokerHost will fit the bill for most players. PokerHost has been around since 2004 and back in 2010 the site became a member of the Merge Gaming Network. This was to be a move that was of benefit to both parties but for PokerHost, it provided the capabilities to serve US poker players. Being listed as US friendly is a massive thing for poker sites, making it possible for more players to gain access to the site. PokerHost claims to be the oldest and most respected poker site on the internet, which is definitely something that you could quibble with but it is certainly a site that poker players can rely on. 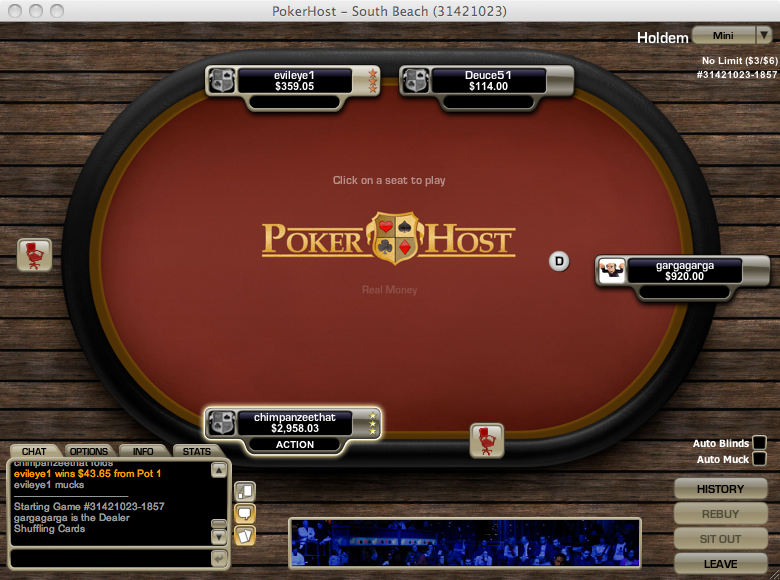 Another way that PokerHost provides more ways for players to gain access to the site is through the use of Mac options. Being able to cater for PC and Mac users is a big thing for an online poker site and PokerHost delivers what very few sites manages to do. While the problems that US poker players have faced in finding a site to play on has been well noted, life has not been easy for Mac users either. The vast majority of online poker sites do not provide Mac download options but this is not an accusation that can be levelled at the PokerHost site. After you have filled in your details, you will have download options presented to you. By choosing the Mac option, you will be playing poker games on your Mac in no time at all. Good bonuses can always make or break the popularity of an online poker site and it is positive to know that PokerHost provides a great range of poker bonuses. New players are in for a special treat thanks to the 200% bonus that is available to players on their initial deposit. This 200% deposit bonus will see players earn up to $5,000 as a bonus with their initial deposit. PokerHost players will receive $5 of their bonus every time that they reach 750 points. A player has a total of 120 days to earn their bonus. This is quite a generous time-scale, especially when compared to the length of time provided by many poker sites. There is obviously a chance to earn a lot of money on poker bonuses with PokerHost so it is good to see that players are provided with a fair opportunity to claim their bonus. There is also a reload bonus available with PokerHost where players can earn a 75% bonus up to a value of $375. Players will receive $5 of their bonus every time they receive 500 VIP points and will have 90 days in total to clear their bonus amount. PokerHost also run a birthday promotion where players will receive $10 into their account on their birthday. This isn’t a massive bonus but it is a nice touch and one that will please many players with respect to making the most of their online poker time. Players from the United States will always have fewer deposit methods open to them with respect to making deposits and this should always be borne in mind. However, PokerHost still manages to provide online and offline deposit capabilities for US poker players. The minimum deposit amount for the site is $20, which is better than what is offered by many sites. In total players, are able to fund their online account by bank transfer, American Express, cash, Visa, MasterCard, Neteller and Moneybookers. Not all of these options may be available to all players so it is important to check and see what options are available to you. With $4,000,000 in guaranteed tournaments on offer every month, there is a good amount of poker to make plans for with PokerHost. There is a different guaranteed tournament every day of the week on PokerHost and the smallest guaranteed amount for the major games is $5,000. On Wednesday nights, the Midweek Monster game provides players with the chance to play for $15,000 while $10,000 is the guaranteed tournament offer on Mondays, Thursday, Fridays and Saturdays. With qualifiers taking place throughout the week as well, there is a great chance to make the most of the big guaranteed tournaments on offer from PokerHost. Of course, it is the Sunday $100,000 Big Ticket Game that is likely to grab the most attention and most of the site builds towards this weekly event. There are plenty of freerolls throughout the week and while some of these freerolls provide cash prizes, there are plenty that provides seats and entry to the Big Ticket Game. It is common for players on PokerHost to use the freeroll games to pave their way to entry onto the major poker games available at the end of the week. There are also four main freerolls taking place each day and VIP players get access to major freerolls too. With poker leagues, bounty tournaments, shootout tournaments and satellite events to major worldwide poker events on offer too, PokerHost has something that should appeal to every kind of poker player. Whether you want to play for big money with big money or enjoy as much fun without paying any money, there is a lot to enjoy. This can be seen with the fact that it is possible to create private poker games and tournaments. If you are the sort of poker player that used to play with your friends and family members but you all now struggle to get together in one place, this is the solution for you. PokerHost provides the platform and you can all play together with no outsiders, making this the perfect social poker opportunity for you and your friends to share. 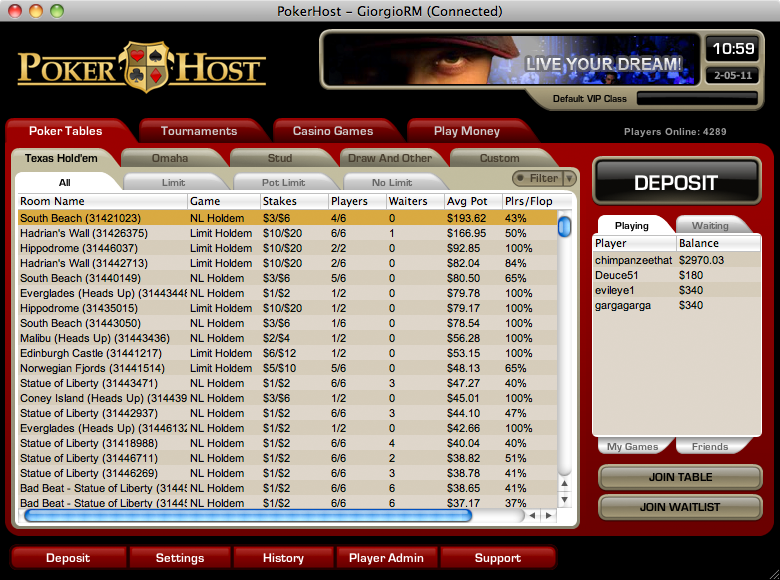 PokerHost also runs occasional seasonal tournaments and limited edition tournaments. A good example of this would come from the recent Turbo OPS Tournament which took place at the end of March 2013. Turbo games are the in-thing on online poker sites at the moment, providing players with fast paced action that never lets up. This allows players with limited online poker time to make the most of their time. With a massive welcome bonus and plenty of great tournaments to enjoy, PokerHost has something for the majority of online poker players. The US friendly nature of the site is well worth celebrating as is the fact that there is a Mac option. No matter what you are looking for from a poker site, PokerHost is likely to have everything you could want or need.